25 Dec 800 Holy Roman Empire¹ ("First Reich"). 6 Aug 1806 Holy Roman Empire dissolved. 19 Oct 1813 Confederation of the Rhine dissolves. 21 Oct 1813 - 20 Jun 1815 Attempted central coordination. 24 Mar 1816 into Nassau. (officially from 28 Mar 1849). the right bank of the Rhine). 1 Jan 1871 German Empire ("Second Reich"). 18 Jan 1871 - 11 Nov 1918 Alsace-Lorraine annexed from France. 1 Dec 1918 - 30 Jun 1930 Allied occupation of the Rhineland. and all colonies surrendered to the Allies. 13 Mar 1938 - 27 Apr 1945 Austria annexed. 21 Oct 1938 - 6 May 1945 Sudetenland annexed from Czechoslovakia. 26 Jun 1943; no Constitutional status given. 1 Sep 1939 - 2 Apr 1945 Danzig annexed. 15 Jun 1940 - 20 Mar 1945 Alsace-Lorraine annexed. ("East" Germany) formed in the east. 6 Aug 1806 Reich dissolved. ¹Constitutionally the entity dealt here is the Reich ruled by the king elected by the electors (Kurfürsten) and crowned king. (It is a matter of dispute whether the king acquires his ruling authority with the election or only with the coronation; both dates are given in the following record.) In theory, his title is just King (König) without territorial appendage. By the time period of the 16th century, it was understood that the king had acquired the dignity and notional authority of a Roman emperor (see below), and the scope of his authority as such was styled the Holy Roman Empire (Heiliges Römisches Reich - Sacrum Romanum Imperium); the addition "of the German Nation" (deutscher Nation - nationis germanicae) comes into official use in the 15th century (e.g., Act of the Imperial Diet [Reichsschluss] of 1486); its meaning has been the subject of considerable dispute since the 17th century. 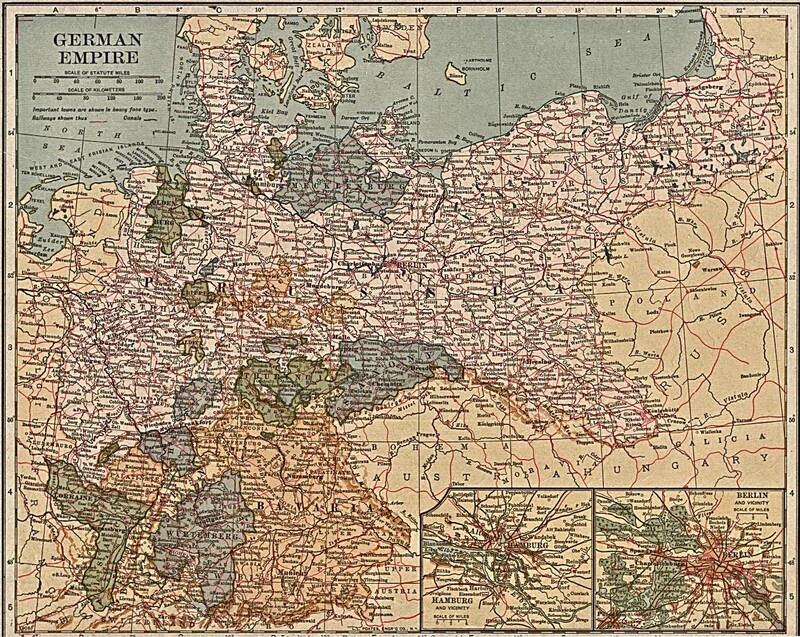 In the time period covered, the imperial authority extended de facto (except for some vestigial remnants, such as the chartering of notaries-public throughout Western Europe) only to the (German) Reich, and official use made no distinctions. Upon his election (and coronation) the person acquired the style of king, whether during the lifetime of the ruler or after an interregnum. Theoretically, he was king just as much as an existing ruler, but this was just theory. In honor of the imperial status of the ruler, the elected and crowned king, if not yet emperor-elect (see above), was styled, not just King or German King, but Roman King (Römischer König - Rex Romanorum, literally "king of the Romans"). With the demise of the imperial authority, by death or abdication, if a Roman King was in existence, he took the style of Roman Emperor-Elect, King in Germany (see above). The imperial coronation by the pope having been discontinued (except for Karl V 24 Feb 1530), it was decided 4 Feb 1508 to forego the formal acquisition of the style of Roman Emperor and to fall back on the theory that an elected German king was ipso facto Roman emperor-elect and to make this point by incorporating this concept into the ruler's style. The full style from 1658 (to which were, of course, attached the styles belonging to the states ruled by the emperor-elect, such as Archduke of Austria) was as follows: Von Gottes Gnaden erwählter römischer Kaiser, R.I.S.A., König in Germanien - Divina favente clementia Romanorum imperator electus et semper augustus, R.I.S.A., rex in Germania. The initials R.I.S.A. stood for Romanorum imperator semper augustus, but were misinterpreted to stand for Romani imperii semper auctor, and this misinterpretation had by the period covered come into official use, being rendered in German as zu allen Zeiten Mehrer des Reichs ("at all times increaser of the empire"). Under the provisions of the Golden Bull of 1356, when there was no king the royal authority was exercised by two imperial vicars (Reichsvikare - vicarii imperii), each with a separate territorial jurisdiction. They were specified to be the count palatine of the Rhine (Pfalzgraf bei Rhein) and the count palatine of Saxony (Pfalzgraf von Sachsen). By the time period covered, the count palatine of Saxony was the duke of Saxony, elector; and the count palatine of the Rhine was the elector with that title, until the interregnum of 1657, when the electorate in question, and with it the county palatine, were in dispute with Bavaria. Note: Under the aegis of Napoléon I, Emperor of the French and King of Italy, a confederation of states resigning from the Reich was formed 25 Jul 1806, Napoléon becoming protecteur de la Confédération du Rhin in addition to his other styles. The Charter (Rheinbundsakte in German) was written in the French language, and called the entity États confédérés du Rhin, but used the term Confédération. The official German term was Rhein-Confoederation, but it was informally styled Rheinbund, the name by which it is known to history. The constituents of the Confederation were technically not states, but rulers. By joining the Confederation some had their rank elevated, notably a few who became grand-dukes (Grossherzog), who were regarded as of royal status. The Diet of the Confederation, as well as its College of Kings, was chaired by the former Archbishop of Mayence, Imperial Archchancellor and Elector, in his capacity as Prince-Primate (Fürstprimas). 25 Jul 1806 Confederation of the Rhine founded. - Elector-archchancellor (formerly archbishop of Mayence). - Elector of Baden, becomes a grand-duke. - Duke of Berg and Cleves, becomes a grand-duke. - Landgrave of Hesse-Darmstadt, becomes a grand-duke. - Prince of Nassau-Usingen, senior of these two becomes a duke. - Count of Leyen, becomes a prince. 19 Oct 1813 Confederation dissolves. Note: After the dissolution of the Rhine Confederation, there was no central authority in Germany until the creation of the German Confederation. An attempt to administer former French satellites and occupied territories in Germany was, however, made, and it was headed by a body called Central Administration Council (Zentralverwaltungsrat). on 28 Apr 1849, he rejects the election. 24 Aug 1866 End of the German Confederation. 10 Nov 1918 Germany a republic (but style Deutsches Reich not abandoned). ²According to the Charter of the German Confederation, "Austria has the chair in the Federal Assembly." Although the Charter does not use the term, this chairmanship is officially styled Präsidium or Bundespräsidium; it is ambiguous whether this style refers to the person or office of the Emperor of Austria. ³According to the Constitution of the North German Confederation, "The Crown of Prussia is entitled to the Presidency of the Confederation" (Präsidium des Bundes). The office does not confer a specific style on the King of Prussia; when exercising it, the style used is "King of Prussia in the name of the North German Confederation." 4Full official style of the ruler: Deutscher Kaiser und König von Preussen, Markgraf zu Brandenburg, Burggraf zu Nürnberg, Graf zu Hohenzollern, souveräner und oberster Herzog von Schlesien wie auch der Grafschaft Glatz, Grossherzog vom Niederrhein und Posen, Herzog zu Sachsen, Westfalen und Engern, zu Pommern, Lüneburg, Holstein und Schleswig, zu Magdeburg, Bremen, Geldern, Cleve, Jülich und Berg, sowie auch der Wenden und Kaschuben, zu Krossen, Lauenburg, Mecklenburg, Landgraf zu Hessen und Thüringen, Markgraf der Ober- und Niederlausitz, Prinz von Oranien, Fürst zu Rügen, zu Ostfriesland, zu Paderborn und Pyrmont, zu Halberstadt, Münster, Minden, Osnabrück, Hildesheim, zu Verden, Kammin, Fulda, Nassau und Moers, gefürsteter Graf zu Henneberg, Graf der Mark und zu Ravensberg, zu Hohnstein, Tecklenburg und Lingen, zu Mansfeld, Sigmaringen und Veringen, Herr zu Frankfurt ("German Emperor and King of Prussia; Margrave of Brandenburg; burgrave of Nürnberg, count of Hohenzollern; sovereign and highest Duke of Silesia as of the county of Glatz; Grand duke of the Lower Rhine and of Posen; Duke of Saxony, Wesphalia, and Angaria, of Pomerania, Lüneburg, Holstein and Schleswig, of Magdeburg, Bremen, Gelders, Cleves, Jülich and Berg, as well as of the Wendes and Kaschubs, of Krossen, Lauenburg, Mecklenburg; Landgrave of Hesse and Thuringia, Margrave of Upper and Lower Lusatia, Prince of Orange, Prince of Rügen, of East Frisia, of Paderborn and Pyrmont, of Halberstadt, Münster, Minden, Osnabrück, Hildesheim, of Verden, Kammin, Fulda, Nassau and Moers; Princely count of Henneberg; Count of the Mark and of Ravensberg, of Hohnstein, Tecklenburg and Lingen, of Mansfeld, Sigmaringen and Veringen, Lord of Frankfurt"). Noble titles: Erzherzog = Archduke; Freiherr = Baron; Fürst = Prince; Graf = Count; Grossherzog = Grand Duke; Herzog = Duke; Kaiser = Emperor; König = King; Prinz = Prince; Reichsfreiherr = Imperial Baron; Reichsgraf = Imperial Count; Ritter = Knight. 2 May 1945 Soviet forces begin the Allied occupation of Berlin. 8 May 1945 Allies accept the unconditional surrender of Germany. 23 May 1945 Allied occupation. 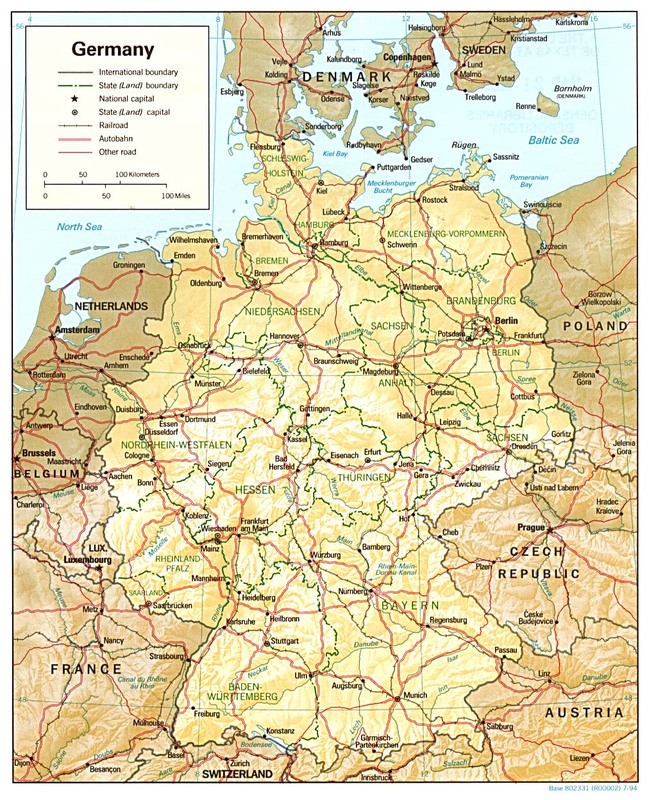 11 Mar 1946 German Economic Council for the British Zone created in Minden. to all German organs within the Soviet Zone). (re-organized on 9 Feb 1948 as part of the United Economic Area). U.K., France, Belgium, Netherlands and Luxembourg). 8 Apr 1949 Trizone ("Trizonia") formed by addition of French zone to "Bizone." road, and canal access to the Berlin sectors under Western control. 21 Sep 1949 - 23 Oct 1954 American, French, and British form Allied High Commission. 7 Oct 1949 Soviet zone becomes German Democratic Republic ("East" Germany). to the ("West") Germany by the Paris Treaties. 21 Sep 1955 Soviet military occupation of "East" Germany ends. 3 Oct 1990 Re-unification of Germany, end of allied control on 15 Mar 1991. Losheimergraben; Hemmeres and a part of Winterspelt municipality). ("West") Germany (effective 28 Aug 1958). uninhabited area of the Kammerwald is separated from Germany). return for a payment of 53 million German Marks as a war indemnity. 29 Sep 1961 Areas are restored to ("West") Germany. Note: No separate administration was established. The nearest unit of the Luxembourg Nature and Forestry Agency became responsible for the area. for the German occupation 1940-45.
indemnity for the return of the areas (effective 1 Aug 1963). "Bizone") and reorganization of the Economic Council. Deutsche Mark by the Western Allies. 7 Sep 1949 Dissolved by founding of the ("West") Germany. Note: Data below for "West" Germany; For data on Germany since 3 Oct 1990 see the table at the top of the page. 23 May 1949 Basic Law enters into force. ("West Germany" to 2 Oct 1990). 5 May 1955 West Germany obtains sovereignty by the Paris Treaties. 3 Oct 1990 Incorporated into the Federal Republic of Germany. Countries Ga-Gi ¹Although initially the government was officially called Regierung, the term Ministerrat was used unofficially and, from 16 Nov 1954, officially; the term Vorsitzender des Ministerrates for its head was made official 8 Dec 1958, replacing the earlier Ministerpräsident. established; the U.S. sought to settle the property claims of U.S. nationals against the G.D.R. ; East Berlin was not officially recognized as the capital of the G.D.R. by France, U.K., and U.S., which together with the U.S.S.R. had special rights and responsibilities in Berlin. 1402 Part of the Duchy of Schleswig-Holstein. 10 Aug 1490 Part of the Duchy of Holstein-Gottorp. 31 Dec 1720 Storm separates Sandy Island from Heligoland. 7 Aug 1714 Part of Denmark. 5 Sep 1807 British occupation. 7 Jan 1864 Ancient Frisian constitution abolished. 9 Aug 1890 Formal handover to Germany by U.K.
8 May 1945 - 1 Mar 1952 British occupation (population evacuated Apr 1945). 1814 - 20 Nov 1815 Allied occupation. annexed to Bavaria (part of Pfalz [Palatinate] province). 11 Nov 1918 - 26 Feb 1920 Allied (French) occupation. 13 Jan 1935 In a plebiscite 90.73% vote to re-join Germany. 1 Mar 1935 Re-incorporated into Germany (but not in Prussia). 20 Mar 1945 - 31 Jul 1945 U.S. occupation. "Saarland" gradually enters into official use after 8 Oct 1946. (for Saarland since 1957 see under Germany). 1 Jun 1919 - 1919 Rhineland Republic, failed French attempt to back separatists. 8 Mar 1921 Franco-Belgian occupation of Düsseldorf, Duisberg and Ruhrort. 24 Jan 1923 Withdrawal U.S. forces, former U.S. zone taken over by France. 11 Jan 1923 - 1 Aug 1924 Franco-Belgian occupation of the Ruhr. (Palatine Republic proclaimed at Speyer (2 Nov 1923 - 17 Feb 1924). Dec 1929 Withdrawal of British forces, zone taken over by Belgium and France. 30 Jun 1930 End of Allied occupation, Rhineland a demilitarized zone. 7 Mar 1936 Rhineland is militarized by Germany. as a buffer between Germany and France). Cologne 26 Oct 1794, Bonn 8 Nov 1794). Nov 1794 French create central administration (Pays d'entre Meuse et Rhin). part of France); Roer, Sarre, Mont Tonnerre, Rhin-et-Moselle. 23 Sep 1802 Unified administration terminated. 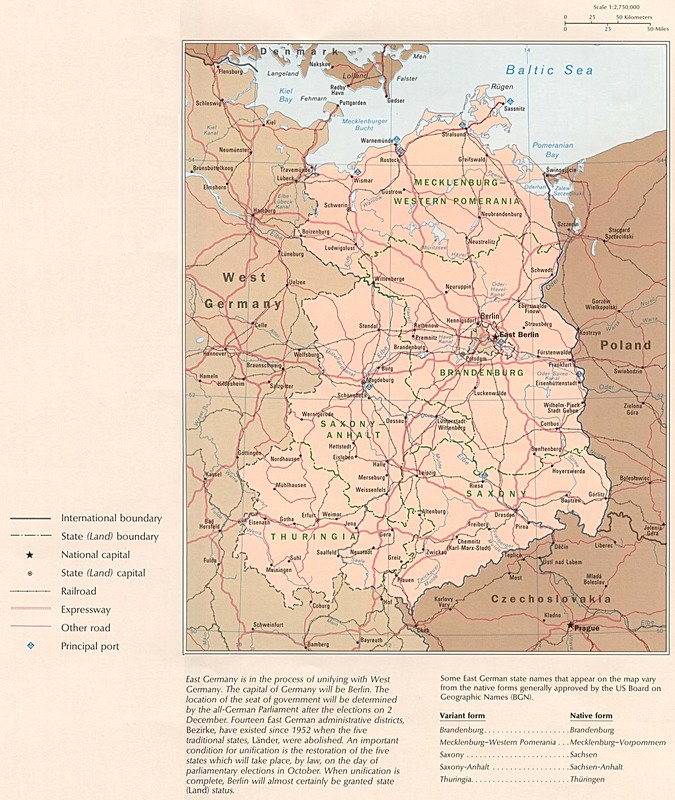 free cities of Hamburg and Lübeck and parts of Holstein. Hoya and part of Hanover. by Prussia and Russia respectively (see East Frisia). Oct 1813 End of French rule. of Bouche-l'Yssel, Ems-Occidental and Yssel-Supérieur. Nov 1813 End of French rule. formed from parts of electorates of Trier and Cologne. electorate of Cologne, and free cities of Cologne and Aachen. of Trier and duchy of Zweibrücken.